Since the DCI unexpectedly unrestricted Regrowth in April, I have been interested in reviving Gush strategies in the format, just as the unrestriction of Burning Wish spurred me to do the same with Ritual strategies with Burning Tendrils. As I warned folks, Regrowth bolsters the greatly diminished GushBond engine in both consistency and speed. It functions in a similar role to Merchant Scroll – a two mana sorcery that usually becomes Gush. The difference is that Regrowth reuses a Gush you have already played whereas Scroll fetches a new one out of your library. Sometimes Regrowth is actually better. Merchant Scroll can only find blue instants. Regrowth can find anything in the graveyard, and recur Time Walk or Black Lotus, or even a countered Yawgmoth’s Will. In my book Understanding Gush: Strategy and Tactics I explained how the restrictions of Merchant Scroll, Brainstorm, and Ponder each weakened the GushBond engine. Even with new substitutes and additions like Preordain, it remained a shadow of its former self. The unrestriction of Regrowth put the GushBond engine in a neutral position of being much stronger than it was in 2010, but not quite as ferocious as 2007. For this reason, I built a strong performing Gush deck following the unrestriction of Regrowth. However, my interest and focus on Burning Tendrils has preempted any serious work and time investment in this project. I played Gush decks continuously from the unrestriction of Gush in late 2010 until my disappointing performance with Cobra Gush at the Vintage Championship last year. The DCI then decided to unrestrict Burning Wish, and I could play my favorite archetype of all time: Burning Tendrils combo. 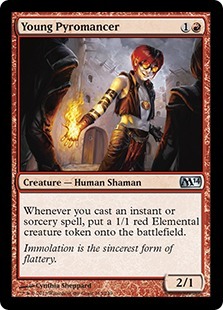 Although I was successful at doing what many players felt were impossible in reviving Dark Rituals in Vintage, the printing of Young Pyromancer is simply too alluring to not play Gush. Since the unrestriction of Gush, the chief obstacle to success has been Mishra’s Workshop-based decks. Workshops punish Gush decks for all of the reasons I lay out in my Gush book, by taking away virtually all of the tactical and design advantages of Gush decks: the virtual card advantage generating by the Turbo Xerox principle, the efficiency of Gush being free, and so much more. Combating Workshops is an uphill battle, at best, for Gush decks. You: Mox, Volcanic Island, Young Pyromancer. Your Opponent: Mishra’s Workshop, Mox, Lodestone Golem. You: Force of Will the Golem, generate a token. At this point, you have 4 permanents on the table. It’s very difficult for most Workshop decks to recover from this board state. Tangle Wire won’t do much. Even if Spheres enter the battlefield, every cantrip and counterspell you play generates more tokens. Pyromancer is unaffected by Thorn of Amethyst. Pyromancer is the solution Grow decks have been looking for. Traditional Grow threats like Quirion Dryad are far too problematic in the contemporary Vintage metagame. First of all, Dryad and its brethren are weak to Jace. It doesn’t matter how large a Dryad is – a single Jace activation will reverse and unwind all of that effort. Pyromancer’s horizontal growth, compared to Dryad’s vertical growth, is actually the key advantage here. 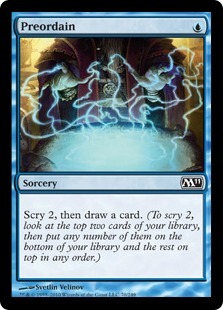 By distributing its power horizontally it overcomes Jace. It’s also so much tactically better against decks like Landstill, which can target their firepower on a single permanent with answers like Engineered Explosives. Engineered Explosives is a particularly limited and far less effectual answer to Pyromancer. You have to choose between wiping out the growing number of tokens – like cleaning out the bacteria without the source of the infection – or the source, while leaving the colony intact. Pyromancer arrives at a moment when the metagame is perfectly positioned for him to exploit. Workshop decks have minimal quantities of cards like Triskelion at the moment, BUG Fish decks are more popular than ever, and slow control decks like Landstill are top tier. Pyromancer clogs up the battlefield against Fish decks, singlehandedly trumps Workshop strategies, and gives slow control decks fits. But by giving Grow a fantastic win condition against Workshops, it revives the Grow archetype. The history of Grow in Vintage basically begins when Patrick Chapin ported the Extended archetype into Type I in the summer of 2002, and then won the largest Type I tournament at GenCon with it. The archetype underwent a radical innovation that fall when Onslaught was printed, and GroATog was born. This deck’s dominance eventually led to the (initial) restriction of Gush. When Gush was unrestricted in the summer of 2007, I immediately took up the charge, and won the 2007 Vintage Championship with this deck. Gush was then restricted (again) in 2008 after another year of dominance. This deck was great for about a month, and then a deep winter of Workshop dominance set it, and it became unviable. The only viable Gush strategy in that environment was Tyrant Oath, and only barely. By the spring Turbo Tezzeret decks and the widespread adoption of Ancient Grudge technology had taken over, and Workshop decks began to subside again. This opened the door to Gush decks once more, and decks like East Coast Wins started to perform well, culminating in a Top 4 finish for both Paul Mastriano and myself in the 2011 Vintage Champs. These decks moved away from the Grow archetype and toward more combo-oriented Gush strategies. I won a tournament in Sandusky with Cobra Gush, and then developed perhaps the most broken use of Gush yet with Maniac Doomsday, which I used to Top 8 the famed Waterbury tournament. Young Pyromancer brings us full circle. Pyromancer singlehandedly revives not only Grow, but I believe gives Gush new life. That is not to say that there are not Gush decks in the format. A search of Vintage Top 8 decklists will uncover many Gush decks in recent Top 8s, from Delver decks to Talrand decks, and the occasional Doomsday deck. Young Pyromancer’s synergy with Gush is undeniable. Just like Dryad, it generates one point of toughness each time Gush is cast, except that it distributes it as a new permanent – virtual card advantage – not just a counter on an existing permanent. Grow is one of the great archetypes of Magic history, and Vintage in particular. Roughly once a year, I am able to develop a really amazing deck for Vintage – Maniac Doomsday in 2011, Burning Tendrils in 2012, and now this for 2013. This is no flash in the pan. I believe that this is the deck to play in Vintage at this moment. I have put a great deal of thought and testing into this list, so I will explain the card choices, and then explain how to play it. I will then recount some of my matches from a recent tournament in Eudemonia, in which I did not lose a match (but did not end up winning the tournament, as I will explain below). The basics of Gush – the Theory of Gush, the functionality of the GushBond Engine, the strategic, tactical, and mana options of the Gush player – are all covered in Understanding Gush, so I won’t cover them here. Instead of breaking up my card choices by tactic, let me speak to my approach to building this deck holistically. First, I wanted to be faithful to the basics of Grow, which is a strategically flexible archetype. It can play a control role, an aggro role, or a combo role. Until Onslaught, it was only capable of being a really good aggro-control deck. But GroATog, with fetchlands and the addition of black, made it possible to be a combo deck. The combo back in 2003 was Berserking a Psychatog, but it was still a lethal combo post-Yawgmoth’s Will. The combo for a Grow deck is the GushBond engine. As I discuss in Understanding Gush, the steps to the GushBond engine are: 1) Fastbond, 2) Gush a bunch, 3) resolve Yawgmoth’s Will, 4) Gush a bunch more, and 5) Finisher. The post-Will Gushes each generate mana, not just card advantage, and will allow you to assemble whichever combo finish you find most efficient, whether it is: 1) Tinker for a robot + Time Walk, 2) Time Vault + Key + Jace, or, in my case, 3) Tendrils of Agony or 4) Time Walk + tons of Pyromancer tokens. When the GushBond engine has been fully executed, any of these finishers will suffice to win the game, and can be implemented with the mana and card advantage derived from the GushBond engine (which is like a Yawgmoth’s Bargain that generates mana post-Will). I knew that I wanted a robust and consistent GushBond engine. This is the first place where I part company from most players, who do not deeply understand the GushBond engine, how it works, or how to build it. They often begin from the approach of just putting Gush in with good cards, as if they are building any other blue control deck. In practical terms, that meant I wanted a maximum complement of Preordain, and only 14 lands, just as is visible in my Grow deck from 2003, 2007, and 2010. In fact, as you peer at the Grow decklists I posted from across those eras, you can immediately observe the similarities, tactically, structurally, and strategically. Instead of Berserk, we now use Tinker or Tendrils. Instead of Counterspell or Mana Drain, we use cards like Spell Pierce, Mental Misstep, or Flusterstorm. And so on. With the loss of 3 Brainstorm, 3 Merchant Scroll, and 3 Ponder, I knew this deck needed 4 Preordain to fill at least some of that gap as an inferior substitute. Preordain performs several critical functions. First, it fulfills the Turbo-Xerox principle of substituting lands for blue cantrips. Preordain is the best unrestricted cantrip in Vintage. Second, it is part of the scaffolding of the GushBond engine, and without it you cannot reliably chain Gushes in a single turn. Here’s the key litmus test: if you start the game with Fastbond in your hand, how often can you win the game on turn 1? With these 17 land, 0 Preordain lists, you can’t do that very reliably. With 4 Preordain and 4 Regrowth, you can get there fairly reliably, as long as you have a Gush in your opening hand or a way to find one. If you want to test your GushBond engine, I suggest you see if your deck can past this litmus test in a 10 game run. How many games can you goldfish out? If it’s lower than 3 or 4, I would reconsider your design approach or rely less on the GushBond engine, like Delver decks have done. Delver decks are a great example of decks that utilize Gush, but not the GushBond engine for a combo finish. My view on Regrowth is something like this: if you don’t run at least three, I don’t see the value in it. One Regrowth wasn’t good enough to make the cut in my 2010 Grow deck, so why would it be good enough now? It’s only when you can run multiples that you can build it into the carapace of your GushBond shell. Four, on the other hand, is probably too many – as you can’t afford to draw 2 in your opening hand very often. I could be wrong, but it seems to me that the value of Regrowth is maximized at 3, whereas, less than that, the opportunity cost of those slots are too high. Without 4 Preordains, you simply cannot consistently execute the GushBond engine. But there is a deeper problem. Without 4 Preordain, you cannot generate maximal virtual card advantage. This is the deepest dimension of advantage to Gush, and among the least well known secret benefits of Gush: the ways in which a deck designed on a tiny mana base generates virtual card advantage over the course of the game. That is also why it is a prominent topic in Understanding Gush. This virtual card advantage can only be seized if you run a tiny mana base. That’s why none of these Grow decks have more than 20 mana sources, a much smaller mana base than big blue decks, and cantrips like Preordain are what make this possible. You can keep a one land hand on the assumption that Preordain, like Ponder and Brainstorm used to do, can find and dig for additional lands. This is the principle described by Alan Comer, who invented Grow and its predecessor, Turbo-Xerox. Decks with 17 lands and 4 Gushes not only stall out reliably executing the GushBond engine, but they draw way too many lands over the course of the game, minimizing both the mana advantage and virtual card advantage of Gush. An example of the former is when you use Gush to make land drops; having 17 lands increases your chances of simply drawing more lands off of Gush, rather than more business. My experience with Cobra Gush proved to me beyond a doubt the value of Jace in the GushBond engine. It’s amazing that it’s actually acceptable, at a critical juncture, to pay 4 mana to Brainstorm, but it is. Jace not only facilitates the GushBond engine in a single turn, but it can jump start a stall out. Jace can be a final play for a turn and allows you to rev up and go off the next turn. It is turn 3, and you have two lands and a Mox in play. You can Gush, floating UU. What does your opponent do? If they counter the Gush, you play replay a land (getting the mana advantage out of Gush), and cast Jace, using the Brainstorm ability to put a land back into your deck. If Gush resolves, it protects and fuels Jace even more so. Gush into Jace is one of the best plays in the format, and was a cornerstone of the old East Coast Wins Gush builds. One way of looking at the GushBond engine is not just scaffolding, but tether or lace. How do you stitch together all of these component parts? Part of the answer is card quality and threat density. If the 2007-8 GushBond era engine lost 3 Brainstorm, 3 Merchant Scroll, and 3 Ponder, at least we now have 4 Preordain, 2 Jace, 4 Regrowth to fill the gap and make up some of that distance. Regrowth has functionality outside of the GushBond engine. This should not be overlooked, but Regrowth is highly synergistic with Young Pyromancer. Regrowth is really two storm: itself and whatever it is you play with it. This often translates into two Elemental tokens with Young Pyromancer. Regrowthing Time Walk means not just 2 more tokens, but 2 more damage (at a minimum). Perhaps the greatest area of difficulty with Grow is combating Workshops. This means more than great tactics like Young Pyromancer; it means artifact removal. In 2010, I borrowed Owen Turtenwald’s Trygon Predator technology. With Young Pyromancer that seemed decidedly suboptimal, especially when Ancient Grudge was available. Ancient Grudge is amazing with Young Pyromancer, even against decks without many artifacts. Blowing up two Moxen can generate 2 tokens with Pyromancer. Ancient Grudge is stupendous against Shops, but also broadly useful. One of the best strategies in this format remains Time Vault combo, like the deck Paul Mastriano used to win the N.Y.S.E. Open I. Ancient Grudge remains an important anti-Key/Vault tactic. It’s also good against Landstill, which wins with Factories, and utilizes cards like Engineered Explosives and Crucible of Worlds to generate big card advantage. The only question is whether I should also run something else to complement them. This turns out to be a difficult question. The deck is somewhat soft to Chalice of the Void set to 2. It cuts off not just Young Pyromancer and a few tutors, but also Ancient Grudge and/or Hurkyl’s Recall. Hurkyl’s Recall is an important tactic for fighting Blightsteel Colossus and large Workshop boards, not to mention it is one of the cards that can help you storm kill without the GushBond engine. Yet it suffers from being susceptible to Chalice at 2. That’s why Nature’s Claim may be an alternative choice at that spot. Ultimately, I think it’s acceptable to run the best card in Hurkyl’s Recall. At the Eudemonia tournament I ran Imperial Seal in that slot, and wished it was Hurkyl’s the entire day. The next big area of design concern is the countermagic suite. The formula for disruption for Grow seems to be 11-13 counterspells or Duress effects. My latest Grow deck only has 10, but Regrowths are often used to recur cards like Force or Flusterstorm, so the overall number is a bit misleading. Force of Will is an obvious inclusion, but given the breadth and range of options, there is nothing obvious beyond that. Duress effects are generally prized in Grow decks, and Thoughtseize is particularly potent in the current metagame. That said, I selected Mental Misstep and Flusterstorm over them, and put a pair of Thoughtseizes into the sideboard. Let’s start with Mental Misstep. Misstep is not the strongest counter in the format, but is a great tempo card. It not only stops restricted spells like Ancestral Recall, Brainstorm and Vampiric Tutor, but is the most efficient tactic for countering Lightning Bolt, Spell Snare, and Thoughtseize. Given the incredible synergy with Young Pyromancer, Mental Misstep as a free spell is one of the best tactics you can use. Countering a Bolt on Pyromancer not only saves the Pyromancer for no mana, but also generates yet another token. Rich Shay says that Mental Misstep is one of the best counters in a Gush deck, and I believe him. 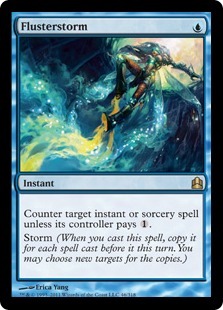 Flusterstorm is probably my second favorite counterspell in the format, after Force of Will. It does so much, ensuring that your best spells will resolve (like Fastbond or Yawgmoth’s Will), and assuredly counters your opponent’s best spells like Tinker or Ancestral. It also can generate card advantage if timed right, countering multiple spells at a time. It’s not difficult to generate storm using Gush, so that is of little consequence either. My teammate Brian DeMars hates Flusterstorm. When asked why, his rationale is that it doesn’t counter anything important or that this deck should be considered about, like Workshop threats, Oath, or the like. His view is that Flusterstorm is a ‘win more’ card because it is for matchups this deck is already strong against. I do not agree with that position, and I think Flusterstorm is a big reason that a deck like this is so strong against Grixis style big-blue decks. Flusterstorm is extremely important in those matchups. Also, omitting Flusterstorm underestimates this decks’ emphasis on deploying critical combo spells. Flusterstorm is important not just to stop opponent’s threats, but to ensure the resolution of your own. This deck wants to make sure that Ancestral Recall, Fastbond, and Yawgmoth’s Will resolve. They are extremely important to the deck’s development and game plan. Flusterstorm is either the best or near the best way to do that. I would like to run a pair of Thoughtseizes maindeck, but could not find the room. Thoughtseize is important not just because it takes a great card, but because of the information it gives and because it is tactically important against cards like Abrupt Decay. Originally, I had a 4th Flusterstorm and a Mindbreak Trap in the sideboard, but cut them at Brian’s urging for a pair of Thoughtseize, where it is also good against control, BUG Fish, and combo. Thoughtseize is also a way to proactively combat Oath of Druids. Thoughtseize can also be recurred with Regrowth for more token generation and disruption. The mana base also deserves explanation. While all four Grow decks I presented above had 14 lands, you’ll notice that the land configuration changes over time. All 4-color lists typically ran 3 Sea, 2 Tropical Island, and 1 Volcanic Island. Because of the centrality of Young Pyromancer, I had to shift that ratio to 2, 2, and 2. Many of those Grow lists only ran on-color Moxen. Because of Lodestone Golem and because of the importance of Young Pyromancer, I decided to include Mox Pearl, raising my total mana count to 20, a high for Grow. The configuration of dual lands I have included does mean that there will be games in which both of your dual lands in a particular color will be destroyed. That is ok. You don’t absolutely need any color to win the game, and you will eventually find the proper Mox or Black Lotus. In building this deck, I agonized over a few card choices. In the tournament I’m about to recap, I could not decide on what to run in the Hurkyl’s Recall slot. Hurkyl’s seemed like overkill with 2 maindeck Ancient Grudges, so I toyed with a number of cards in that slot: Lightning Bolt, Fire/Ice, a Thoughtseize, a third Jace, a fourth Regrowth, and Imperial Seal. Bolt is attractive given this decks’ emphasis on the board. It can clear out a critical blocker and clear the way for an attack. It is also strategically useful against Jace and Lodestone Golem. Fire/Ice also seemed attractive for hitting Dark Confidants, and for being blue. At Eudemonia, I ran Imperial Seal in that slot, a choice I soon regretted. I think Hurkyl’s Recall is deserving of that spot, although the other options have a strong case, especially the third Jace. The sideboard is basically standard procedure at this point. I run 4 Leylines and 2 Jailers for Dredge, and have in every blue deck for years now. The 3 Ingot Chewer, 3 Nature’s Claim, and 1 Mountain package is for Workshops. I take out 3 Mental Misstep, 3 Flusterstorm, and a Regrowth for those slots. The 2 Thoughtseize are for combo, Fish, and control decks. I would normally run 4 Ingot Chewer – despite its lack of synergy with Young Pyromancer, but I had to have at least 3 Nature’s Claim given this deck’s inherent weakness to Oath. The anti-Oath package here is 3 Nature’s Claim and 2 Thoughtseize. Grafdigger’s Cage is not a serious option given the centrality of Yawgmoth’s Will to this strategy. I arrived at Eudemonia with the decklist above, with the only difference being that I ran Imperial Seal over Hurkyl’s Recall maindeck. I had scheduled this tournament and promoted it, so I was very pleased that 24 players came to compete, and among them would be former Vintage Championship finalists Blaine Christiansen and Rich Shay. What was unfortunate about this opening hand is that I didn’t have any fetchlands, meaning my first land drop would be exposed to Wasteland, which is exactly what happened. In fact, he Wastelanded me three times in the first four turns, but I was fortunate to continue to draw lands. When I was finally into Gushing range, I cast Gush (breaking a Standstill), and Dustin Mana Drained it, which was fine with me each time because I used it to make additional land drops and play other spells. Young Pyromancer resolved in just such a scenario. I used Ancient Grudge to kill a Factory. A Trinket Mage found Engineered Explosives, which wiped out a bunch of tokens when I flashed back Grudge targeting it, but left Pyromancer on the table. The Pyromancer finally took over the game, and a few large attacks ended the game after a middling Yawgmoth’s Will. My opening hand was one that is a normally risky hand, but I was on the draw, and it has a potentially explosive start, so I kept it. He played Faerie Conclave and Mox Ruby. I drew Tropical Island for my turn (yes! ), and cast Black Lotus, which resolved, and cast Pyromancer, which resolved. I played Time Walk (triggering Pyromancer for an Elemental token), and it too resolved. I untapped, drew Jace for the turn, played a Tropical Island, and attacked for 3. On turn three I Gushed, which he Mana Drained, but I then played Jace, which resolved, and slowly took over. I ended up winning the game by GushBonding into Regrowth into Time Walk for a lethal attack. Up until this point I had faced Blaine 3 times in a tournament and never beaten him once. He beat me 2-0 in the Vintage Championship last year (playing Workshops against my Cobra Gush deck), and he ended up in the finals. He beat me in the first tournament in which I played Burning Tendrils last fall, and then he beat me at the last Eudemonia tournament as well. My revenge was imminent, and I think we both sensed it. My opening hand was a broken start with Black Lotus in it. I played Lotus, and cast Preordain, then Brainstorm, which found Ancestral, so I fetched out a land to shuffle my deck, then cast Ancestral and played one other spell, I think a Demonic Tutor, and passed the turn. Blaine opened with Workshop, Thorn, and Black Lotus – playing them in the wrong order, which prevented him from playing a turn one Lodestone Golem, which I would have had to Force. Instead, I untapped and cast Young Pyromancer, and then Grudged his subsequent Golem, and took over the game. I felt that this hand was acceptable because of the density of anti-artifact spells in my deck. When Blaine exploded onto the battlefield with Workshop and Black Lotus again, I regretted keeping that hand. He played Genesis Chamber, Steel Overseer, and a bunch of other artifacts on the first turn, and a Tangle Wire on the second. I scooped just a few turns into this game to his growing army. This game reminded me of the value of Hurkyl’s Recall, which may have saved me. This was a very long and grindy game. Blaine opened with Workshop and Genesis Chamber, which I Forced, and then, I believe, an Arcbound Ravager. I played an early Young Pyromancer. Blaine emptied his hand (missing land drops because his hand was so dense with threats), and had double Tangle Wire on the table as well as a Null Brooch and, eventually, two Thorns of Amethyst! The turn he played Academy, Null Brooch, I was able to Ponder into Lotus to cast Young Pyromancer. The Pyromancer allowed me to get back into the game, and block attacks with Ravager. He played Genesis Chamber, and we both missed a trigger on each side of our table. At a critical moment, I Preordained into an Ingot Chewer, which allowed me to destroy his Signal Pest through the Null Brooch and Thorns. Eventually, I made a few land drops that allowed me to break the game open. His Null Brooch was incredible, basically preventing me from playing anything until I found the Ingot Chewer. He even used it to counter a Mox. Once I had enough lands, it didn’t matter because my token generation outpaced his and I could play two spells a turn. I made the mistake of not attacking him sooner with not only my tokens, but the pair of Pyromancers I put on the table. This gave him more turns to find outs, but I eventually got there in turns of time. Victory! I played Sapphire, Ancestral, drawing Force of Will and Jace. I played Regrowth on Ancestral, and passed the turn. He played Chalice of the Void set to 1, and I Forced it. I untapped and drew a land. I played Ancestral, drew another Regrowth, Regrowthed Ancestral, and played it again! He scooped shortly thereafter. Nothing like three Ancestrals in a row! Ryan mulliganed to 4, but opened with Workshop, Trinisphere! Fortunately, I kept a hand with 3 lands in it and drew 2 more. I led with Island, Mountain, fetchland, and on his fourth turn end step I played Vampiric Tutor for Ancient Grudge, which I used to destroy his Trinisphere and a Lodestone Golem a turn or two later. I was able to play this despite his Wasteland and Strip Mine. I played Pyromancer and Demonic Tutored for a second Ancient Grudge, which won the game. During round 5, I was observing a match, along with many other players, between Rich Shay and Jeff Neilson. During the course of the third game, in which Rich was gaining control over the board state, Rich played a Black Lotus into a Chalice at 0. From behind Jeff, I pointed out the Chalice at 0, and the judge was called. Apparently Chalice of the Void’s trigger is optional now and not mandatory, and my interference was considered an infraction called “outside assistance” under the Infraction Procedure Guide. The penalty for this infraction is a match loss at this REL level. The judge explained to me that it would be assessed in the next round, causing me to lose my Top 8 match. This was extremely frustrating for me, but an important lesson that I will no longer comment on matches going on, even in somewhat casual Vintage environments. My very young, but precocious opponent was stunned to learn that I had been given a match loss, which was announced after the Top 8 pairings were announced. Although I was extremely upset at what happened, I tried my best to internalize my frustration, rather than vent, and did not comment any further on what transpired at all during my match with Michael. Amid his apparent confusion, we assured him it had nothing to do with him, but he was interested in playing out a match – as was I. If he beat me, then I would have felt much better about getting knocked out. In any case, I came to game! My opponent emptied his hand, but I Force of Willed his Skullclamp, pitching Time Walk, and he was out of gas. He resolved a Memnite and an Arcbound Ravager. When he put a second Ravager on the stack, I responded by Ancient Grudging both of his creatures. On turn four, I was able to combo him out with GushBond. He opened with Ancient Tomb, Sol Ring, Steel Overseer, and Mox Opal. My opening hand had two lands, Mox Sapphire, Merchant Scroll, Nature’s Claim, Preordain, and something else I can’t remember. I decided to lead with Mox Sapphire, Preordain in order to keep open a play with Nature’s Claim. When I played Preordain, I saw another Nature’s Claim, so I decided I would Claim something now, but wasn’t sure what to hit. I thought about hitting Sol Ring, but decided to destroy his creature instead. On his next turn, he played a Memory Jar, and I was very pleased he decided to pass the turn. I untapped and Claimed the Memory Jar, which he wisely decided not to activate. I cast Merchant Scroll for Ancestral Recall, and passed the turn. He played a Lodestone Golem, but I quickly destroyed it and took over the game. Young Pyromancer hit the table soon thereafter, and I was able to GushBond into Tendrils a turn later. I was pretty depressed not only to lose the Top 8 match, but more importantly, the opportunity to play Rich Shay in the next round, whom I have a 4-1 lifetime record against, and who ended up winning the tournament. I took off valuable weekend time for this tournament and was basically knocked out of the Top 8 not to a skill mistake, but an honest mistake due to ignorance of a recent rules change. I probably shouldn’t have commented in any case, but I honestly did not know that I was helping a player – I thought that Chalice triggers were mandatory. I am buoyed, however, by how insane this deck is. About once a year I am able to create a deck that changes the format or affects it in a deep way. I believe this is my contribution to Vintage for this year, and, like my Doomsday deck from 2011, my Burning Tendrils deck from 2012, and many other decks of the past (such as Meandeck Gifts), I am extremely excited to see people win tournaments with this.